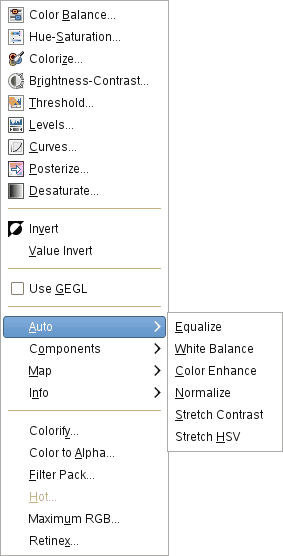 The Auto submenu contains operations which automatically adjust the distribution of colors in the active layer, without requiring any input from the user. Several of these operations are actually implemented as plugins. You can access this submenu from the image window through Colors → Auto. GIMP has several automatic commands for stretching the columns of the histogram for the color channels of the active layer. By pushing bright pixels to the right and dark pixels to the left, they make bright pixels brighter and dark pixels darker, which enhances the contrast in the layer. Some of the commands stretch the three color channels equally, so that the hues are not changed. Other commands stretch each of the color channels separately, which changes the hues. The way the stretching is done varies with the different commands and the results look different. It is not easy to predict exactly what each command will do. If you know exactly what you are doing, you can get the same results, and even more, with the Levels tool. Here are examples of the results of these commands, all together on one page, so you can compare them more easily. The most appropriate command depends upon your image, so you should try each of them to see which command works best on it. This layer doesn't have any very bright or very dark pixels, so it works well with these commands.